Why I’m glad I have a brother. 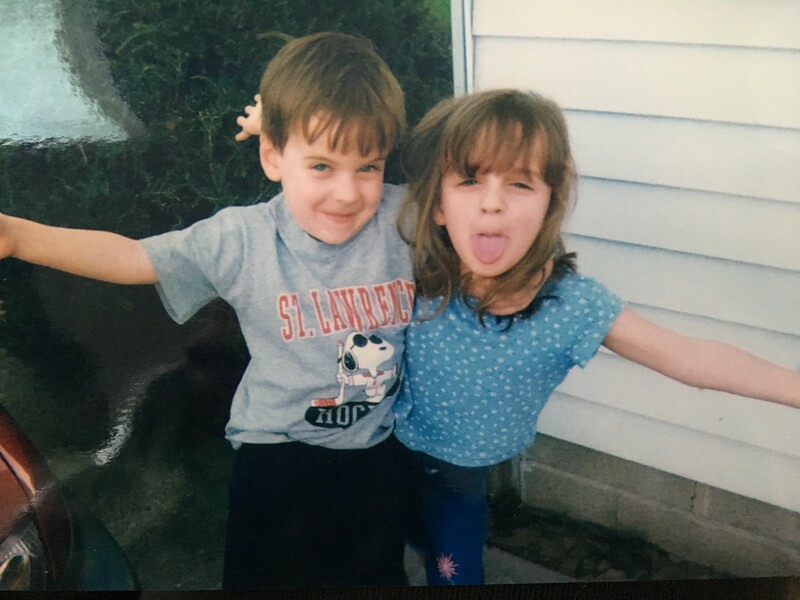 How Having a Sibling Helped Me Thrive. A year and five months after I was born, my parents brought home my brother. Lets just say the transition wasn’t easy, according to my parents anyway. My Mom can recall numerous instances where she would look in the rear view mirror and see my little foot over my infant brother’s head, repeating a phrase I’d been hearing fairly often: “don’t kick your brother!” Fast forward twenty years later though, and I can now give you ten reasons why I’m glad I have a brother. My brother once pushed me into a dollhouse and knocked out my tooth. He also accidentally gave me a black eye with a pumpkin. But hey, I accidentally knocked him down a couple stairs when he was a baby, and I didn’t take that dollhouse incident lying down, so we’re even right? We both have wanted nothing more than to leave the small town where we grew up. We’ve spent countless hours imagining all the different places we wanted to live and work. He has never, ever allowed me to forget my goals, and I will forever be indebted to him for that. He knows how to give me advice better than anyone. When you have a brother who openly admits he will do and say things just to irritate you, learning to not let it get to you sort of happens automatically. It may take a very long time, but it will happen. My brother actually got his first job before I did when he was fourteen. He has always been an incredibly hard worker and has not had a single employer who didn’t love him. I took note of that, and still strive to be the same way. I give him full credit for my work ethic. It’s always nice to have someone who lives under the same roof as you do that can relate when Mom and Dad are being frustrating! Whenever I was being bratty, lazy, or was just plain wrong about something, my brother was never afraid to confront me about it. As harsh and as hurtful as he could be sometimes, he pointed things out to me that I never would’ve known I needed to fix if it wasn’t for him. Two weeks after Mom and I brought our cat home, we decided she needed a sister and Mom thought my brother should pick her out. We went to the shelter and it didn’t take long for him to pick the cat that sat in his lap the moment we got there and didn’t leave. As soon as we got in the car that cat hissed and scratched him, then came and sat with me. Ten years later, she still hates my brother and adores me. Thanks to my brother, I have my favorite little companion. One thing my brother and I never really talked about growing up was relationships. In spite of that, my brother was still able to look up from his phone one day, say: “I bet I can name off every guy you ever liked in high school”, and name almost all of them. My relationship with my brother only got better as we got older. The best thing about him is that we can go a significant amount of time without talking, but feel like nothing has changed at all when we see each other. It’s comforting to know that no matter what, my brother will always remain a constant, consistent person in my life, and I’m thankful for that every day. I can’t imagine what life would be like without him. Originally published at ardentlylauren.wordpress.com on April 5, 2017.